Very nice email reporting! [shown on ioS] Certainly handy for PCs backed up remotely [over VPN]. 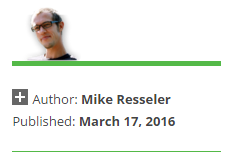 We have crossed another milestone for Veeam Endpoint Backup FREE early last week - 500,000 unique downloads! click to register on the forums and sign-up for these automated weekly newsletters that 37994 users alread receive. 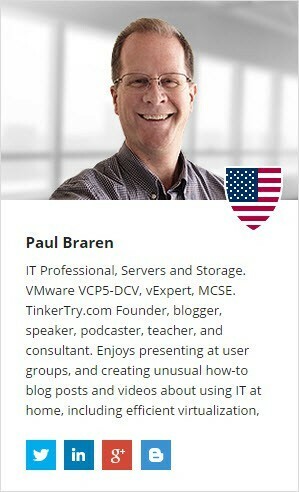 If you're an IT guy like me who runs a vSphere home lab, or just any recent Windows version running as a server, you could go with configuring VEB to use a centralized repository (not a drive letter or network share) for daily backups that will also hold your VM backups, as mentioned in my recent Veeam Availability Suite v9 post. 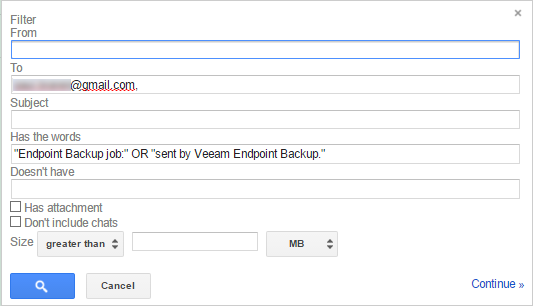 With Veeam Endpoint Backup FREE 1.5 you have an option to automatically eject your USB device after backup has completed. 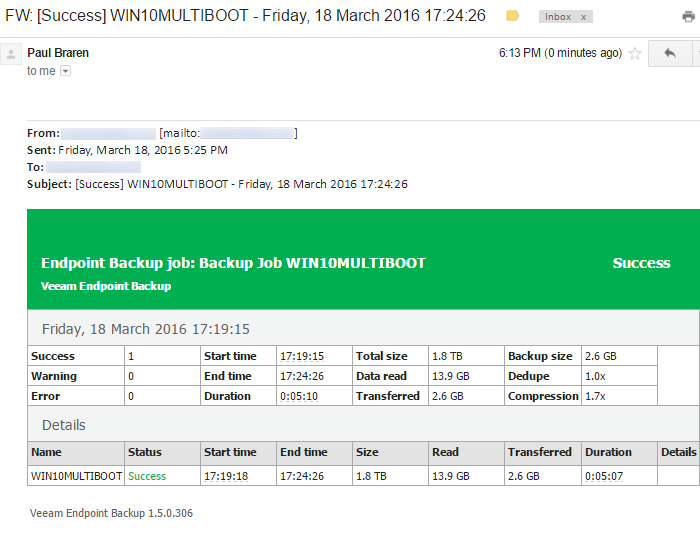 I blogged previously about CryptoLocker and Veeam Endpoint Backup. Of course, that one new feature could make all the difference for your family member. Advise your PC user to attach a drive, and backup automatically begins a few seconds later. When it's done, the drive letter goes away in Windows, automatically. To backup again, merely unplug the USB cable (or power off the enclosure), then plug it back in (or power it back on). Upgrade from 1.1 to 1.5 video, email notifications and advanced testing of USB automatic eject feature. 200GB backed up in 5 minutes [admittedly, big de-dupe happening here]! Tip, use port 587, and if 2-step authentication is turned on, use the application specific Gmail password. Best practices, use secure connection. Be aware, not all ISP's SMTP gateways work from anywhere a laptop may go, so something like Gmail might be a better choice. To test, try temporarily tethering to mobile hotspot, then use the "Test Message button" again. If you use something like boxcar.io for push notifications, forwarding off a copy of your filtered Gmail rule works nicely. 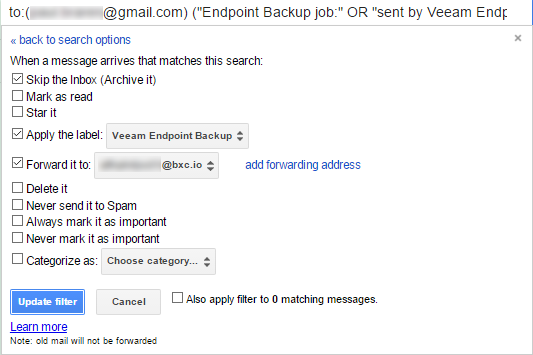 "Endpoint Backup job:" OR "sent by Veeam Endpoint Backup." 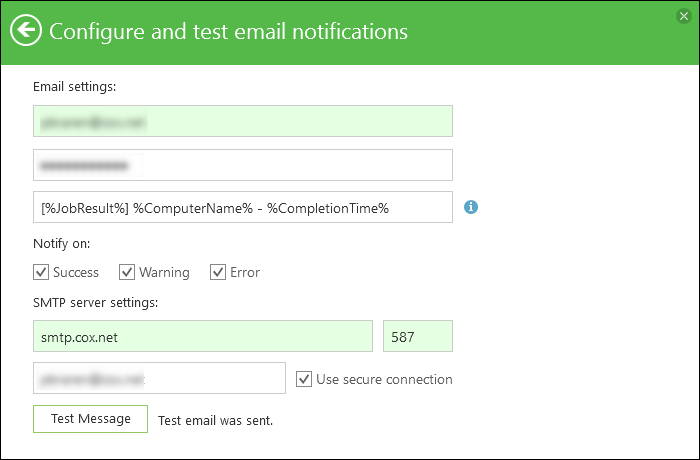 to be sure only test messages and actual backup results notifications are filtered. Step 1 - Setting up a Gmail filter. Step 2 - Page 2 of the filter. Instead of cluttering my Inbox, these alerts get moved off to an IMAP folder, and a copy goes to my boxcar.io account to push an alert to my phone, automatically quieted when the phone is in night mode. Here's how an email notification looks in your gmail inbox. Baar, Switzerland: March 22, 2016: Veeam® Software, the innovative provider of solutions that deliver Availability for the Always-On Enterprise™, today announces Direct Restore to Microsoft Azure, available for preview as a FREE, pre-configured Azure appliance in the Microsoft Azure Marketplace that delivers cloud restore for Veeam Backup & Replication™ and Veeam Endpoint Backup™. Available now this new solution enables users to take on-premises workloads and restore or migrate them to the cloud using an automated physical-to-virtual or virtual-to-virtual conversion process. with "Use secure connection" checkbox on. If you have Google 2-Step Verification turned on, you'll also need to create an App password. 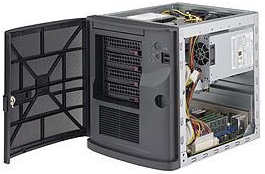 Looking for a great home server for all your PC backups?